Automatic data backup before syncing Outlook data. Automatic Outlook data backup before sync. Back up Microsoft Outlook folders before each synchronization. In order to save time and avoid unwanted results after Outlook data synchronization, it is very useful to create backup before sync. To make sure your data is always safe, Sync2 comes integrated with Folder Backup for Outlook. 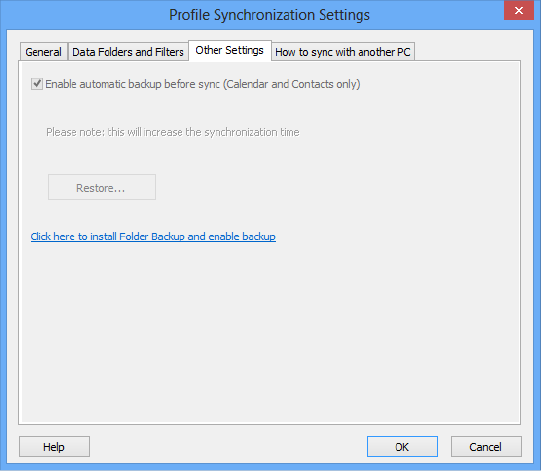 It creates a backup of Outlook Calendar and Contacts folders before each synchronization automatically. If you want to install Folder Backup for Outlook, go to File -> Settings -> Other settings in Sync2 application. Restore Outlook Calendar and Contacts in one click. The backup of your Microsoft Outlook folders is done automatically and you do not need to worry about it. When for some reason you need to restore Calendar or Contacts folder to the previous state, you can simply do it in a couple of clicks. The restore can be done from the Folder Backup tab on the Outlook’s Toolbar or from Sync2 settings. Restore the synchronized data in case something goes wrong with it, e.g. duplicates were created because of incorrect synchronization settings. Fix such issues in one click. You are able to choose the date of the backup from the list and restore it to that particular date. 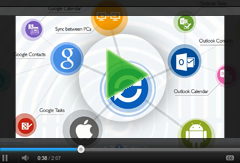 Benefits of using Folder Backup for Outlook together with Sync2. The Folder Backup tool integration highly improves the way Microsoft Outlook data is backed up before synchronization. The previous backup solution was creating additional subfolders as backups, which created duplicate items in Outlook as a result. This complicates the search and overloads Outlook with data you might not even need. Folder Backup works in a completely different way - it backs up the whole PST file and creates backup files with the changes before each synchronization. None of the data is duplicated in Outlook. The backup PST files are kept separately and can be restored whenever they are needed in a couple of clicks. By installing Folder Backup for Outlook together with Sync2 you can also back up one additional folder besides Calendar and Contacts. If you would like to back up more folders, purchase Folder Backup Pro Edition. This tool is easy to use and guarantees the safety of your data. In case you want to try out some third party tools or add-ins that might affect your data integrity, use Folder Backup to back up your folders in one click before that.